Uses: Airport, Government Colors: Black Lengths: 3 panel 5'-9", 5 panel 9'-5" Heights: 4'-0"
Jacobs Company prides themselves on providing quality products and services to the U.S. Department of Defense. 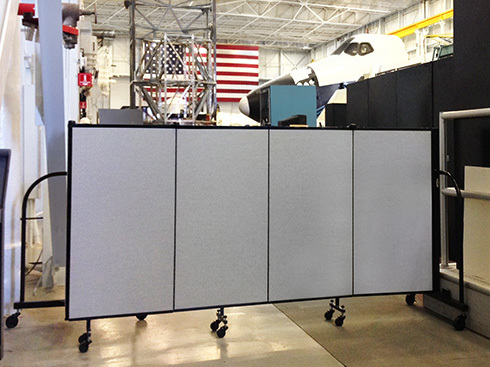 So when Jacobs needed a room divider to restrict access to a hanger where employees fix military equipment, they turned to Screenflex for assistance. The company wanted a durable partition that would last them for years to come, easy to operate, met their high safety standards and provided them with the visibility they required. Our experienced sales staff worked with Jacobs to procure the correct length and height panels for their needs. To allow adequate visibility over the room divider, a four-foot high by five-foot, nine-inch long divider and a four-foot high by nine-foot, five-inch long panels were selected. Since Screenflex room dividers roll on self-leveling caster wheels, Jacobs was confident their room dividers would roll easily over their uneven factory floors. To find the right sized room divider for your space view our 36 sizes and 38 colors selections.